Sorry, Heathcliff. Sure, you’re kind of hot and one of my favorite literary characters of all time, and my heart goes out to the torment you had to endure, but…you’re straight up bananas. Maybe some other time? Well, friends. That other time has come. The way I see it, there are three Heathcliffs. There’s the young foundling Heathcliff who is taken in by the Earnshaws and made to feel like he has a home–until Mr. Earnshaw dies and that beast Hindley casts him out with the servants. Then there’s Heathcliff as a young man, besotted with his soul mate, Cathy, full of feelings and heartbreak and love. And finally, there’s rich, vengeful, batcrap crazy Heathcliff who wants to seek revenge on everyone who crosses his path. Obviously, I’d like to concentrate on the middle Heathcliff for today. Here’s what I love about that young, impressionable Heathcliff: he’s on the cusp of who he’ll grow up to be, and he has the potential to be a decent person. Hindley is horrible to him, lashing him just for kicks and treating him like the dirt on his boot, and Heathcliff refuses to let it break him. For Heathcliff, he can bear anything as long as he has his Cathy, because the sun rises and sets by her. (Or it would, if there were any sun on those moors. They seem pretty bleak.) He lives for those moments they spend together, being wild and getting muddy, acting like two crazy kids without a care in the world. Even still, Heathcliff loves her, and he cries when she ignores him for nights on end. He confesses to Nelly Dean that he wishes he were fair and fine like Edgar, and he gets all dressed up and puts a ribbon in his hair and everything, hoping to be Cathy’s equal again–and then he gets mocked and called a vagabond and beaten. So yeah, he’s got some issues. But Heathcliff’s breaking point is when he hears Cathy confess that it would degrade her to marry him. And why, because he’s broody and has a little dirt under his fingernails from sleeping in the stables? What other choice does he have but to run away, get super rich, and return ready to exact revenge on all those snobs who hurt him? Okay, he has other choices, but they wouldn’t make for as good a novel now, would they? Let’s be clear: As with most Byronic heroes, I wouldn’t want to know Heathcliff in real life. I definitely would not want to fawn over him and put myself in the path of his destruction. But on the page? I totally want to hug him. 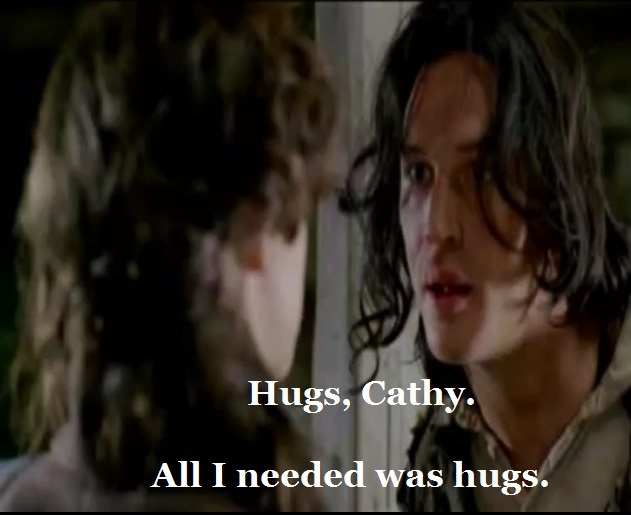 Heathcliff is a guy who could use more hugs in his life. In her one perfect novel, Emily Bronte gave us a character we’ll never, ever stop talking about. There are far more layers to Heathcliff than I could begin to talk about in one simple blog post, but for today, I’ll settle for honoring his hunkiness. 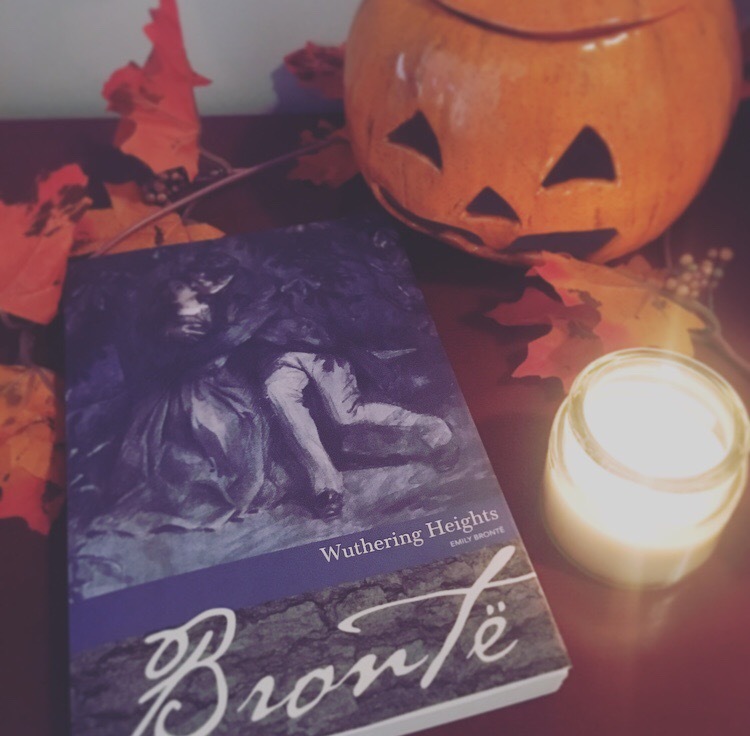 I won’t be visiting any haunted houses this Halloween and I’d rather not be spooked by any ghosts, but a trip to Wuthering Heights with that ghoulish Heathcliff? That I can do. Do you have a favorite cinematic Heathcliff? He’s a tough character to portray on screen, but in my opinion, Tom Hardy nails it in the 2009 BBC adaptation.